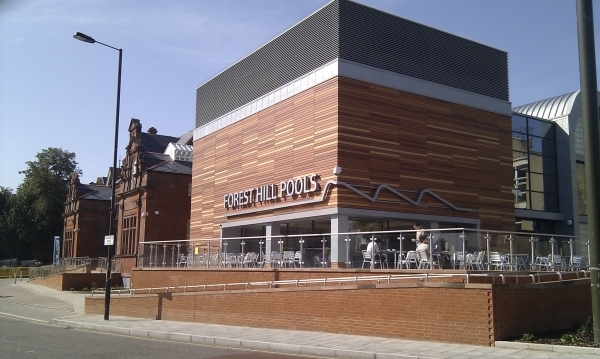 Forest Hill Society: Everything's Going to Look Bloomin' Marvellous! Quetta Kaye (Chair, Environment Committee) provided information for this report. See the Forest Hill Society’s website for updates, which will be posted when details become available. 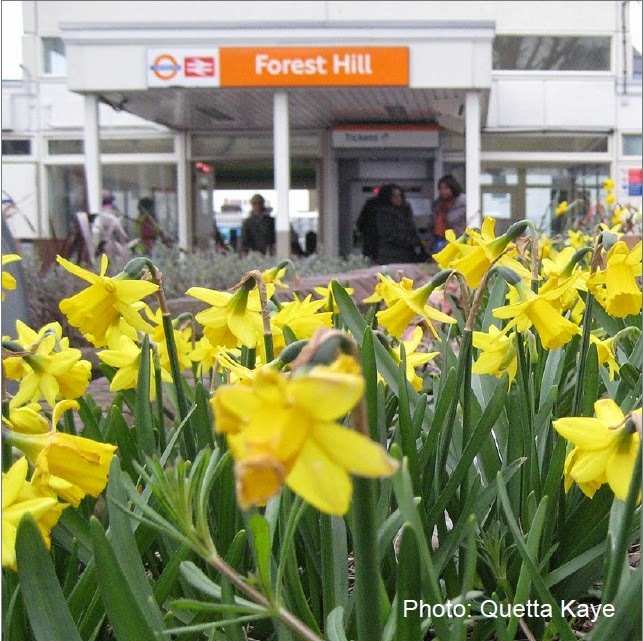 Forest Hill station*: A working group is to be organised soon to tidy up the station’s platform and forecourt planters. This is in preparation for the Forest Hill Society’s entry for London in Bloom’s annual It’s Your Neighbourhood scheme, which is run by the RHS Britain in Bloom campaign. Judging takes place between 29th June-17th July, 2015. Job Centre Plus, 32-34 Dartmouth Road: Before Christmas nearly 600 free bulbs supplied by the Metropolitan Public Gardens Association were planted beneath the trees in front of the Centre by volunteers. Horniman Triangle play area*: On Thursday, 9th April from 11am-2pm, 30 hedgerow whips (young bare-root saplings) provided by the Woodland Trust are to be planted by Nature’s Gym and a general litter pick-up and tidying exercise is to be undertaken — volunteers are welcome! By early spring, 400 bulbs that were planted by volunteers in mid-December are expected to be blooming. London Road pavement, opposite the Horniman Museum: Transport for London has advised us that two Indian Bean trees will soon be planted to fill in the gaps left by former trees. London and Dartmouth Roads: The Edible High Road will continue its journey this year with local businesses sponsoring tubs of fragrant plants, adding vitality and interest to the town centre this summer. Each tub will comprise either a Bay tree, lavender or rosemary and be surrounded by Sanvitalia, a yellow trailing daisy-like plant. Potting-up day is planned for Saturday, 25th April (11:30am-3pm) at the Devonshire Road Nature Reserve, 170 Devonshire Road, with distribution planned for Saturday, 9th May (3-5pm). Volunteers are not just welcome, they are actively encouraged! The Forest Hill Society is encouraging people to plant easy-to-grow hops which, when ripe and harvested, can be combined with those of others as part of a community project to produce a local beer — perhaps even Forest Hill's own version of Crystal Palace’s Palace Pint? 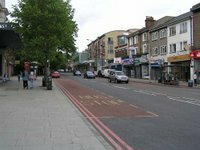 Clutter clean-upTown centre: Plans are on-going, through campaigning work by the Society working with local businesses, but progress is slow, in tidying up the unsightly areas above and beside Forest Hill station’s underpass. In the long term, we are working on an environmental campaign to consider car use in Forest Hill that will seek to address the problems of air pollution, noise, safety, and parking issues created by both through traffic and local traffic. * Funding for plants and associated materials for these areas was awarded to the Forest Hill Society in November by the Forest Hill Assembly for the 2014-15 year, under the auspices of the Society’s Making Forest Hill Beautiful proposal.